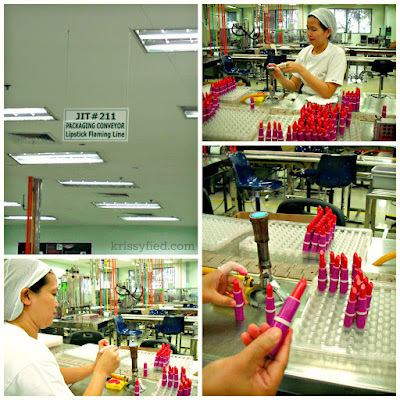 Have you ever looked at your lipstick and wondered how it's made? I've always been inquisitive. Ever since I was a young kid, I've always been curious about the different things around me and have always wondered how they work. I especially love reading about inventions and discoveries - serendipitous or not - and how people came up with them. Today, Avon fed my inquisitive nature by showing me (and other invited bloggers) the manufacturing process involved in making the make-up, lotion, and other beauty and personal care products they carry. We visited their plant in Laguna for a tour and I swear this tour is one of the best bloggers' events I've attended yet! 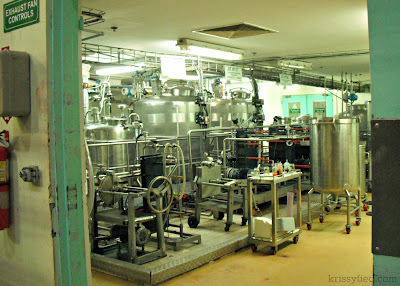 It brought me back to my Kindergarten days when we visited a popular softdrink's plant for our field trip! 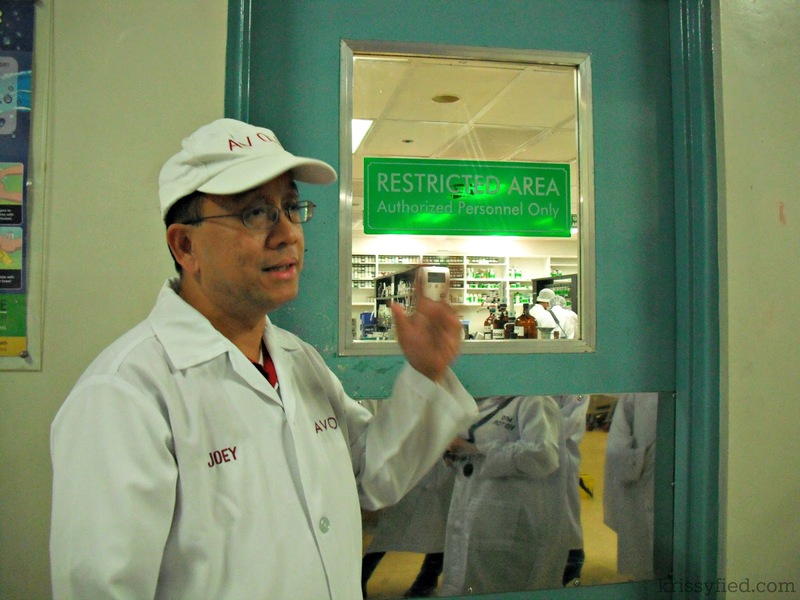 Avon's manufacturing plant in Laguna sits in 7 hectares of land. 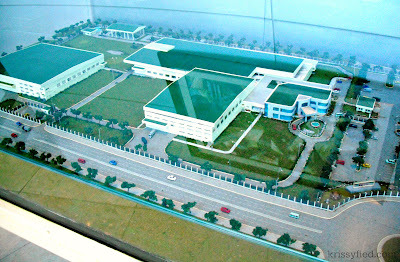 This is where they manufacture almost everything (except for the jewelry) you see on the bi-monthly brochures. 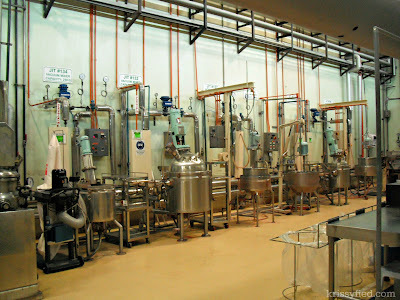 Do you know that this plant can manufacture 43 million bottles of lotion (among others) within 250 days? Before the tour started we were shown a video about Avon's history and growth through the years (do you know that Avon Philippines even exports to neighboring countries, with some products even reaching as far as Canada? ), their waste-segregation techniques, and green projects. I'm going to share some photos with you guys, although we weren't allowed to take photos in some areas (like the production area and QA center) for confidentiality and security purposes. Me, Shen and Kira in our lab gowns, hair nets, and face masks. This is to ensure sanitation is well-maintained even when there are visitors. Sir John Adriatico was our tour guide. He was very patient with us even though we had lots of questions heehee. The raw products of your Avon lotions are mixed here. 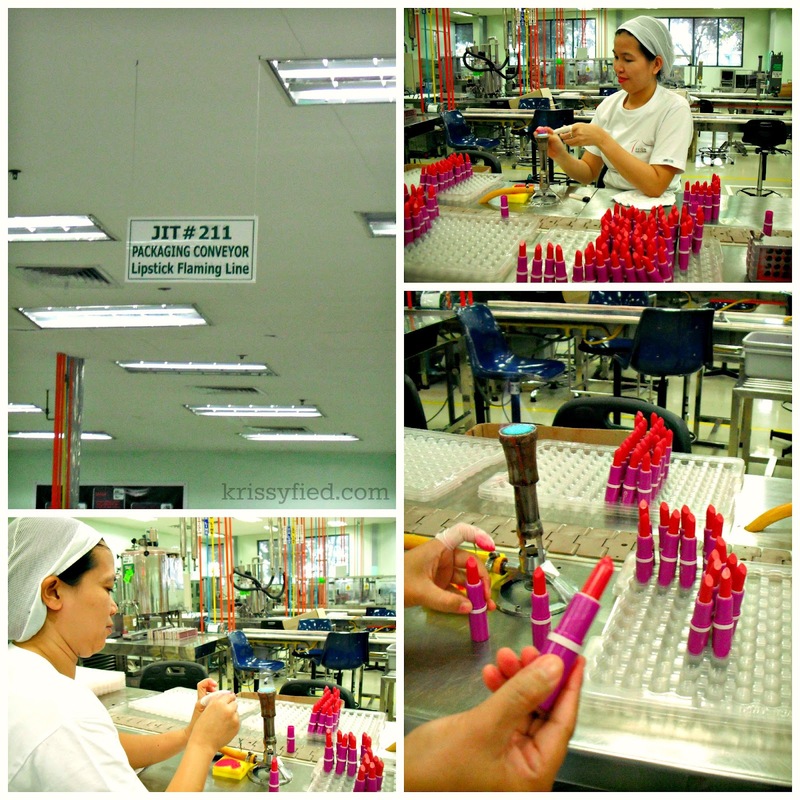 We witnessed how lipsticks are placed in tubes, but this area is the Lipstick Flaming Line area. Here, they run the tubes over a blue flame to give them sheen. Compare the lipsticks on the case and the one the lady is holding. Cool, huh? to make one feel drunk. Cooool. 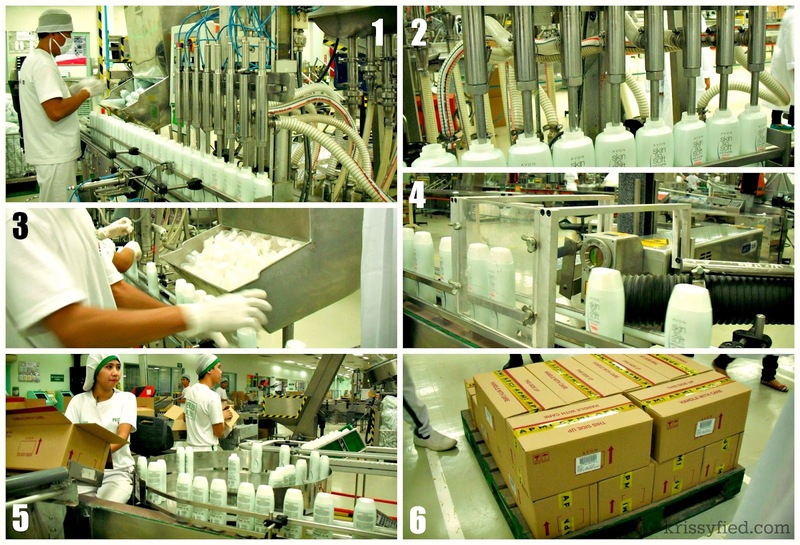 Here is how they make and bottle the lotions. 1). The guy arranges the empty bottles on the conveyor. 2). A machine puts lotion inside the bottles. 3). They put the bottle-caps on but don't seal it yet, because... 4). A machine does it. 5). The bottles are put in boxes... 6). which are then sealed and put in the warehouse to prepare for delivery. There were also designated areas for Avon employees' well-being, recreation, and engagement. Gotta love a company that looks after its employees well! 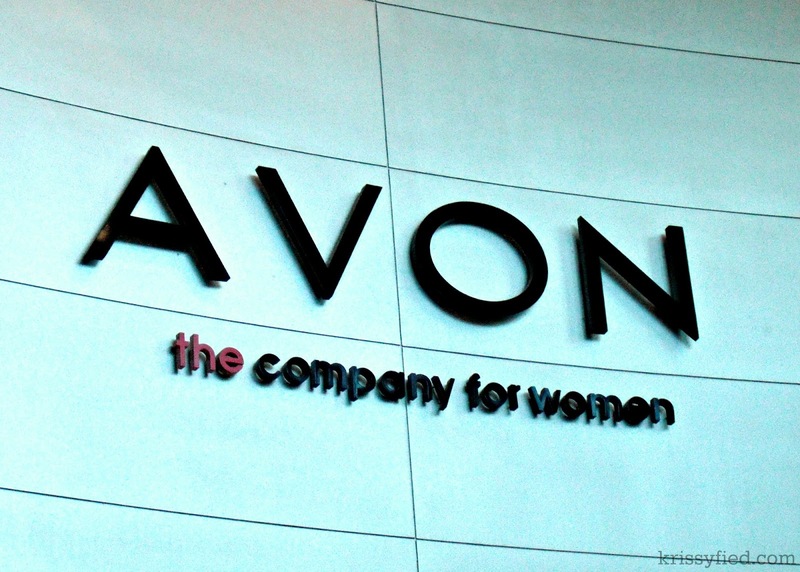 Aside from that, I can attest how stringent Avon is when it comes to hygiene, sanitation, and quality control in manufacturing their products. It doesn't matter that they can manufacture thousands of batches of their products --- each unit is given utmost TLC during the 3.2 hours of production. 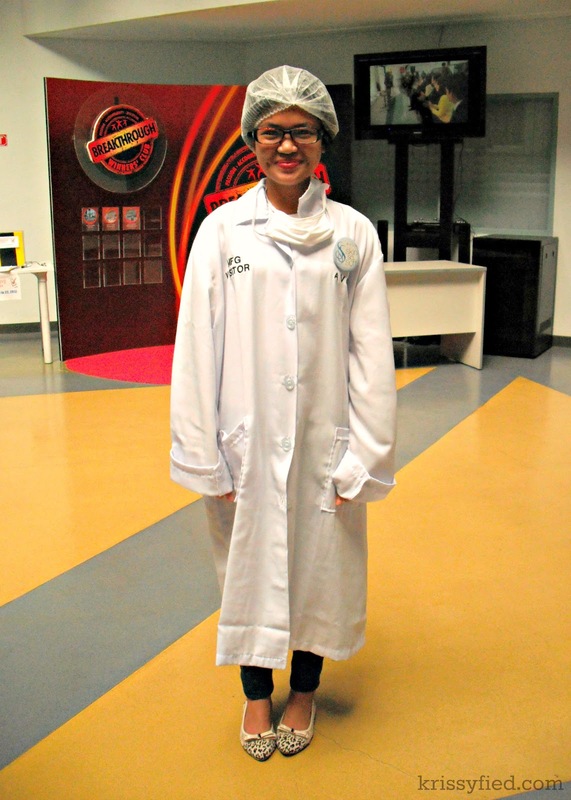 I felt like I was a little girl caught playing pretend doctor in my 'grown-up' garb! 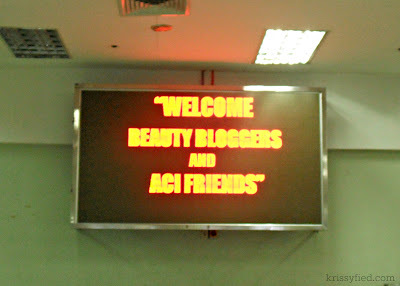 Additional trivia: Do you know that Avon associates greet others with Good morning! regardless of the time? It's because they regard mornings as the time when we are most energetic and perky so in doing so, they hope it can translate to better 'vibes' all throughout the day. 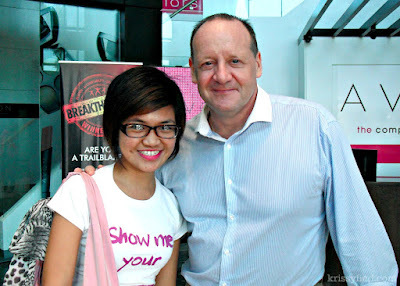 With Mr. Colin Whittington, General Manager of Avon Products Manufacturing Inc.
Part of the fun is meeting with my old friends in the blogging community like Argie, Shen, Kira and Hazel, while it was my first time to meet Bambi, Jessa and Shiela. Also in the photo with me and Kira is Lhen of Ogilvy PR. After the tour, we had a mini open forum where new products under the Skin So Soft line were introduced to us. I will blog about them in a separate post (because skin care is srs bznz, y'all) but let me show you the gift bag given to us because it's so pretteh! Polka dots! Pink and brown color combo! 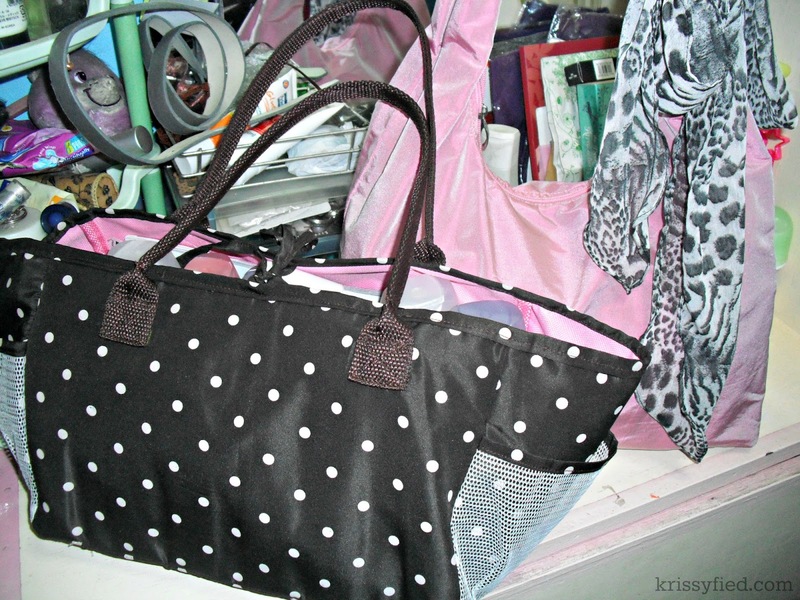 And it perfectly matches the bag I used today! Exclamation points!!! Off the bat I can tell you they all smell GREAT. My mom actually loves these and orders them from our neighborhood Avon lady all the time! 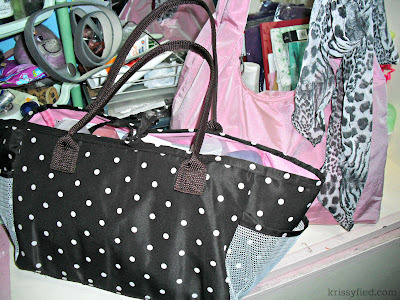 Lookie, the bag also has dividers and a detachable mini zippered purse! Plus points for companies that give press kits on reusable bags because it shows concern for the environment. Big thanks to Avon and Ogilvy for inviting me to go to this tour. I really enjoyed it because I learned a lot! 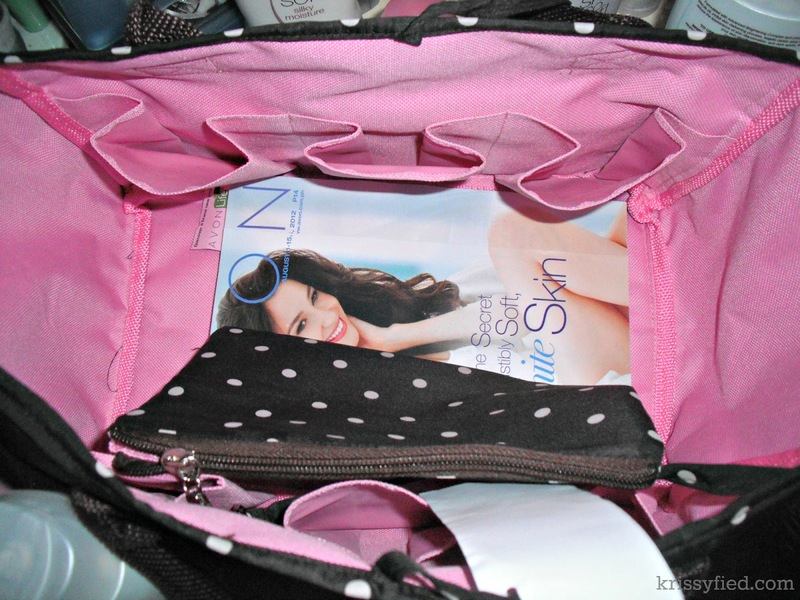 I actually learned to appreciate my make-up and personal care products more after seeing how much thought and effort goes into them. I will never look at a tube of lipstick or a bottle of lotion the same way again. And just like that, it's Saturday. 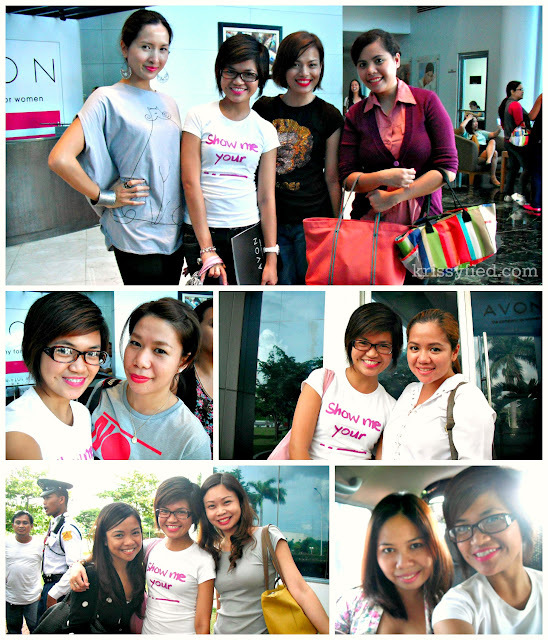 MANELS X Bloggers United key fob giveaway! To be fierce and feisty like Merida.